The Medipex NHS Innovation Awards bring together the most innovative and exciting people from the region’s NHS and commercial healthcare sector. Over 12 years, the event has established a reputation for showcasing outstanding projects and initiatives from across Yorkshire, Humber and East Midland regions, providing a unique opportunity to showcase new innovations and thinking from the NHS. The competition is open to all NHS employees in Yorkshire and Humber the East Midlands, or anyone working with an NHS employee (e.g. a company, university employee or individual). This category is for innovations relating to the development of a new medical device, technology, piece of equipment or diagnostic tool. Innovations which have potential to improve the quality, efficiency and productivity of services across the NHS. This category is for innovations relating to improvements in mental health care. In particular, improving access to services and outcomes for vulnerable service users. Innovations relating to improvements in primary care. For example; assisting independent living, reducing hospitals admissions, improvement of prescribing and remote management of patients. Innovations related to improving the self-management of long term conditions. For example; promotion of healthy lifestyle, increasing access & understanding of key disease indicators, educational materials, improving remote access for patients. The Entry Form can be downloaded here: 2017 Innovation Awards Entry Form. Entries can be submitted via email or post and must be typed (faxed and handwritten entries will not be accepted). Email to: clare.steele-childe@medipex.co.uk. Or send by post to: Clare Steele-Childe, Event Manager, Medipex Ltd, Pure Offices Ltd, 4100 Park Approach, Thorpe Park, Leeds, LS15 8GB. The closing date for entries is 5pm on Wednesday 30th November 2016 (entries will not be accepted after this time). The competition rules and regulations are enclosed in the entry form. Finalists will be invited to attend an awards dinner and ceremony on Thursday 23rdMarch 2017 when the winners will be announced. The prize money will be given to the appropriate clinical directorate on the understanding it will be ring-fenced for the winner. 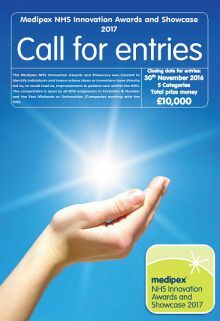 Entrants are required to use the prize money for the benefit of their idea or innovation.